Stay at Somerset on the Pier. Hobart's only waterfront serviced apartments. Somerset on the Pier's serviced apartments in Hobart offer both business and leisure travellers a chance to experience quality 4.5 star i bedroom self contained apartment accommodation in a superb waterfront location. 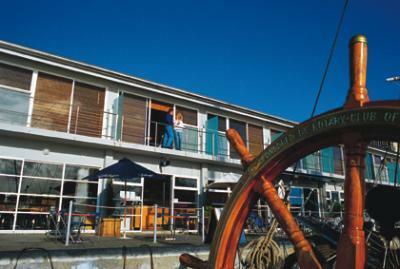 This Hobart accommodation is ideally located on the Hobart waterfront. Nearby Attractions : Somerset on the Pier is the ideal base to explore Hobart and its surrounds. Just a few minutes stroll to Salamanca Place and markets, Battery Point, Museum and Art Gallery, Maritime Museum, Hobart city centre and River cruises. Just a few minutes drive to Wrest Point Casino, Mount Wellington, Botanical Gardens, Cadbury Schweppes Chocolate Factory and Cascade Brewery. The Surrounding Areas include Richmond, Port Arthur, East Coast, Trout fishing, Wildlife parks, Huon Valley, Hastings Caves and Thermal Springs, Tahune Airwalk and National Parks. 1 Bed Executive Apartment : Sleeps up to 3 guests on 1 King Bed, Or 2 Single Beds. 1 Bed Premier Apartment : Sleeps up to 3 guests on 1 King Bed, Or 2 Single Beds. 2 Bed 2 Bath Executive Apt : Sleeps up to 5 guests on 1 King & 2 Single Beds, Or 4 Single Beds. 2 Bed 2 Bath Premier Apartment : Sleeps up to 5 guests on 1 King & 2 Single Beds, Or 4 Single Beds. Executive 1 Bed Apartment : Sleeps up to 3 guests on 1 King Bed, Or 2 Single Beds.